Try the one of a kind FullFonts word processor for free today! FullFonts is a one of a kind word processor that allows you to insert your own shapes, markings, and symbols into a document just as you would any other letter or number on your keyboard. Creating and inserting custom symbols with FullFonts is easier and faster than using font editors, and your created symbols are immediately available in many different fonts and styles. FullFonts is also a keyboard layout editor that allows you to specify which symbol is inserted into a document when a particular keyboard key is pressed. English letters and numbers can be typed into FullFonts documents as soon as the program is installed, but the keyboard layout can also be completely changed so that each key is associated with one of your created symbols. 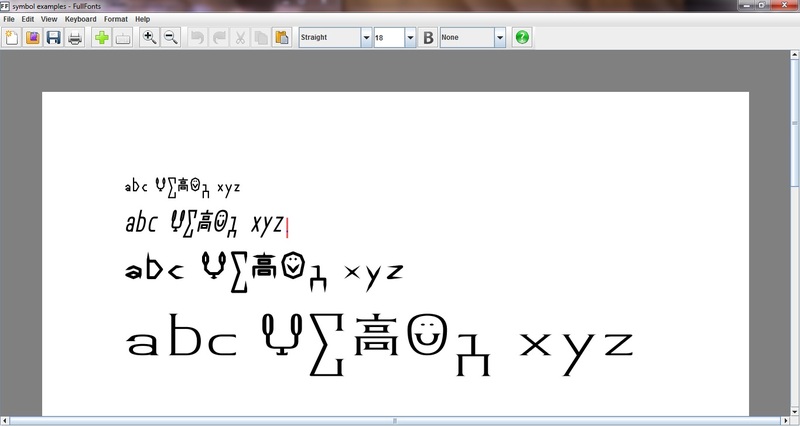 With a document containing your created symbols you can type messages in a secret code or in an entirely new language. FullFonts can also be used to type in a right to left or a vertical writing direction. No other word processor gives the user as much freedom to dictate what appears on their document’s pages as they type. Page Watermark None "Trial Mode"
System Requirements: Microsoft Windows / 2 GB RAM / 10 MB free disk space. © 2010 - 2019 SymbolChooser Software LLC.